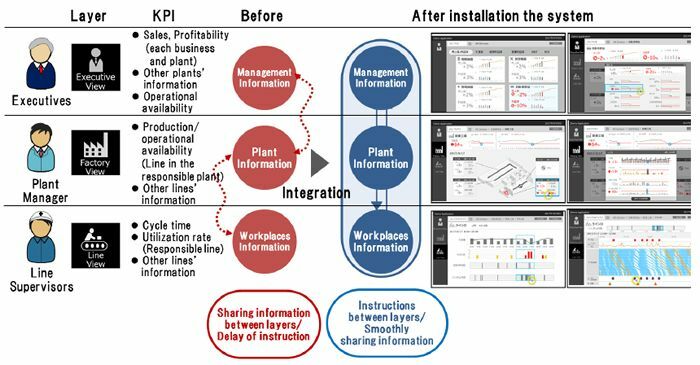 Tokyo, October 12, 2017 -- Hitachi, Ltd. (TSE: 6501, Hitachi) announced today that in collaboration with Daicel Corporation (TSE:4202, Daicel), it has developed a management and manufacturing dashboard utilizing IoT1 to integrally visualize KPIs2 from management information to manufacturing workplaces' situation. This enables for executives, plant managers and production line supervisors to make decisions more rapidly by grasping useful information quantitatively and in a timely manner to improve management and productivity. The system was developed taking full advantage of 4M (Man, Machine, Material and Method) data in manufacturing workplaces, which has been collected through the image analysis system to detect signs of deviations in front-line workers' motions and facility failures as part of the Collaborative Creation projects carried out by Hitachi and Daicel. Daicel has been introducing in phases manufacturing dashboard for production line supervisors from October 2017 to its Harima Plant (Tatsuno, Hyogo Prefecture), which manufactures core components for automobile airbags. Management dashboard for executives is also under consideration and scheduled to be fully operated. In addition, the system will be introduced to six of Daicel's overseas plants, aiming to accelerate management decision-making from global perspective and to further improve manufacturing productivity and product quality. Moreover, Hitachi aims to proactively expand the system to manufacturers worldwide as one of the solution cores for the industrial field of the IoT platform "Lumada". In recent years, associated with the diversification of customer needs, globally intensified competition and the advancement of digitalization, the market environment for manufacturers has been changing rapidly. In order to rapidly respond to these circumstances, it is essential to build a business and production management system to promptly grasp and solve the issues of management and manufacturing utilizing IoT. In these circumstances, Hitachi and Daicel have been proceeding with Collaborative Creation projects since February 2015, with a commitment to optimizing the entire production with an approach based on the Production System Maturity Model3 . The first step in the Collaborative Creation was the development of an image analysis system in July 2016 to detect signs of deviations in front-line workers' motions and facility failures, whose introduction has been completed at Daicel's Harima Plant and the Plant in China, and is currently proceeding in the Plant in Korea and Thailand. And then, its introduction is planned at the plants in the United States and Europe. Daicel is working on stabilizing product quality and productivity improvement at global level. By taking full advantage of 4M data collected at the manufacturing workplaces of Daicel, and by utilizing Daicel's production expertise and Hitachi's technology and knowledge of the IoT platform "Lumada", which integrates OT4 and IT, Hitachi and Daicel have now developed a management and manufacturing dashboard to integrally visualize KPIs from management information to manufacturing workplaces' situations. Utilizing 4M data in manufacturing workplaces, this system shows KPIs chronologically in graph form, which is helpful for making decisions to improve management and productivity, for each managing layer of executives, plant managers and production line supervisors. For instance, as KPIs for executives, it indicates sales, profitability, cash flow, and operational availability by business and plant, and as KPIs for plant managers, it indicates production amount and operational availability by line in the responsible plant as well as other plants' information. As KPIs for production line supervisors, it indicates the cycle time and utilization rate by responsible line as well as other lines' information. This system makes it possible to accelerate the cycle from understanding of the situation to problem identification, evaluation analysis and improvement from the viewpoint of the overall optimization for each layer. In addition, the system supports the combination of information in manufacturing premises that operate globally (e.g. processing results, video of works, etc. ), analyzing the causes of defects by utilizing big data analysis technology, and making improvement measure proposals that contribute to global product quality improvements by feeding the outcome back to manufacturing workplaces. It can also provides useful KPIs that lead to improvement activities, prioritizing viewpoints at the manufacturing workplaces, by taking advantage of the achievements where Hitachi has provided solutions for a wide range of manufacturers and the OT knowledge that it has accumulated as a manufacturer, as well as its original KPI Tree Modeling Technology*5 . For example, for achieving "ultimate cost management," one of Daicel's most important KPIs, it becomes possible to seamless analysis from executives to manufacturing workplaces by collecting the work results such as actual work hours and delays against the standard takt, setup time, and waiting time due to equipment, and then by connecting the work results with high class KPIs (e.g. operational availability and manufacturing costs). This system build an environment where visualization and analysis can be operated efficiently by adopting the functions of "Lumada" such as data integration infrastructure, which unifies the formats of collected data, and data lake, which efficiently organizes and stores a broad variety of big data. Furthermore, starting at the Harima Plants, Hitachi and Daicel plan to implement this management and manufacturing dashboard at six of the main overseas plants, and aim to globally expand the services of integrated management solutions by aggregating and analyzing information via the cloud. *3Production System Maturity Model: The model that is under consideration by the International Electrotechnical Commission (IEC) shows the development stage of the production system. Based on this model, Hitachi modelizes the scope and actions for each level when building a manufacturing execution integrated management system phase by phase. Regarding Daicel, the systems' functions correspond to Level 5 to 6. *5KPI Tree Modeling Technology: Technology that enables qualification and visualization of costs and benefits related to measures by KPI model that was modelized KPIs on management and KPIs at workplaces, and by associating the two KPI groups. The management and manufacturing dashboard will be introduced at Hitachi Social Innovation Forum 2017 TOKYO to be held by Hitachi at the Tokyo International Forum from Wednesday, November 1 to Thursday, November 2, 2017.